During the event period, the probability rates of obtaining Giga and Tera brooches increases. In addition, items will be gifted if you synthesize brooches at least 10 times for each type of synthesizer. ※ This event applies to SD, BSK, and FOT brooches. 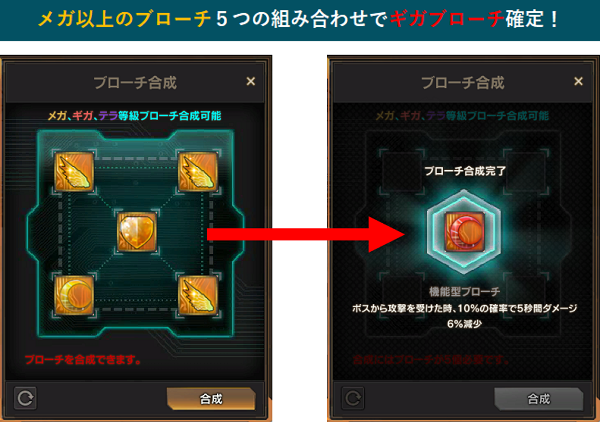 ① If you synthesize a combination of 5 Mega (or higher-ranked) brooches, it will result to a guaranteed Giga brooch. 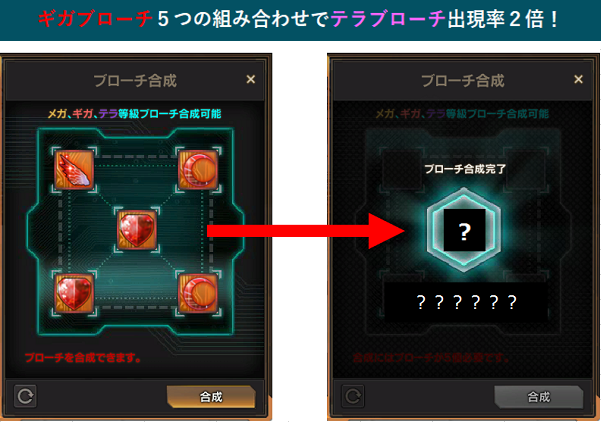 ② If you synthesize a combination of 5 Giga brooches, the probability of obtaining a Tera brooch doubles. ③ Items will be gifted if you synthesize brooches at least 10 times for each type of synthesizer. ※ There is no change in synthesis probability rates if ① or ② are not met. ※ 5 brooches with the same theme are required for brooch synthesis. ※ The 「Lower-grade Brooch Synthesizer」 can be bought in the S Coin Shop. ・ Please note that the in-game reward items are subject to a receipt deadline 7 days after distribution. ・ Please note that all contents related to the matters/items and the campaign published in this notice page may be subject to change without prior notice. ・ Please abide by the rules when participating in the event. In the event that a fraudulent activity with the intention of obtaining the gifts and rewards that is against the Terms of Service is confirmed, the corresponding character will not receive the rewards. Furthermore, additional measures will be made against those players. ・ Please note that the campaign contents may be subject to change or cancelled due to unforeseen circumstances. We highly encourage everyone to join our SoulWorker HQ Discord. Most english players use that to interact with each other and share their game experiences, as well as to disseminate events, updates, etc. Soul Worker HQ is an English Community based around the MMORPG Soul Worker Online, developed by Lion Games and Published by Hangame. Official Art, Game Content and Screenshots are trademarks and copyrights of Lion Games and Hangame.